Ladies! Need a refresher course on how to eat food in front of man who has asked you out? Unsure of what kind of fruit you can eat on a date? This ladymag from the 1950s has you covered. 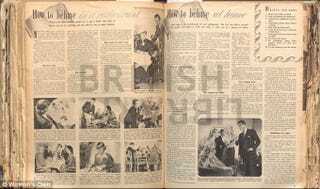 The Daily Mail has highlights from "How to Behave in a Restaurant," an article that appeared in a 1954 edition of Woman's Own (which is still in print today). Let's jump in this time machine and have some fun re-visiting Pat Robertson's dream world, shall we? The magazine announces that it is "HIS JOB TO ORDER." Yes, he went to college for this and was rigorously screened and interviewed before getting this job or ordering all food for women, too. So don't step on his toes, OK? 'The man always does the ordering, never ask the waiter yourself for anything." Remember, you're a lady. Your job is to smile and look pretty and not eat any foods that might look unpretty when you eat them. You're not supposed to have stupid words coming out of your mouth trying to ask for things. Sheesh. I shouldn't have to explain this to you. The magazine article also cautions against picking certain fruits because "fruit causes some embarrassment." "Oh my God, Mary! Is that an orange? I'm so embarrassed for you. JESUS CHRIST, MARY WHAT ARE YOU THINKING? Are you trying to ruin us all? Get that thing out of here before they banish us!" If you insist on enduring the public shame of eating fruit, make sure you check your GPS before determining how you should eat it. "On the Continent, fruit is always eaten with a knife and fork but in this country it is sometimes correct to cut the apple or pear into sections and eat it with your fingers or just the fork." If you are stranded on a desert island and you get asked out on a date by the imaginary man you've crafted from palm fronds and dead crabs, you can just go ahead whatever fruit you're able to forage to survive with your bare hands. "Cherries should be put into the mouth whole and the stones carefully placed on a spoon." Remember, ladies—save that cherry stem tying trick with your tongue for when you meet his mother. The magazine also has advice for all you butter finger women out there. If you drop a knife "you do not start frantically hunting to retrieve it, ask the waiter to bring you a clean one." But wait, I thought I wasn't allowed to talk to the waiter! WHAT DO I DO NOW? HELLO, 1950s? A little help?